Arriving at decisions and making choices can be difficult at times as each choice we make has repercussions and consequences in the future. The choices and decisions we will make in the future depend on what we do now, just as the choices and decisions we make now have been influenced by our previous choices. Choosing one option over many possibilities means we miss out on some opportunities which can determine our level of satisfaction with choices we do make, or with situations we find ourselves in that we can’t control. Given a set of options for us to choose from (where we have to make a specific choice), the introduction of another option that is less optimal and inferior can provide an alternative comparative reference to influence us into choosing one of the previous options. This tactic is used to influence us make choices that are predetermined, but not by ourselves. Psychologists from the University of Basel have published a paper in the Journal of Neuroscience which explains how they conducted two experiments on choice and influence. The first was to study the decision-making behavior of students, and second to measure brain activity and satisfaction when an alternative possibility is added to a pre-existing choice problem. In classical economics, there is the theory that when we’re faced with a decision we will always choose the option that is of greatest benefit to us and have little to no concern for the benefit to others. 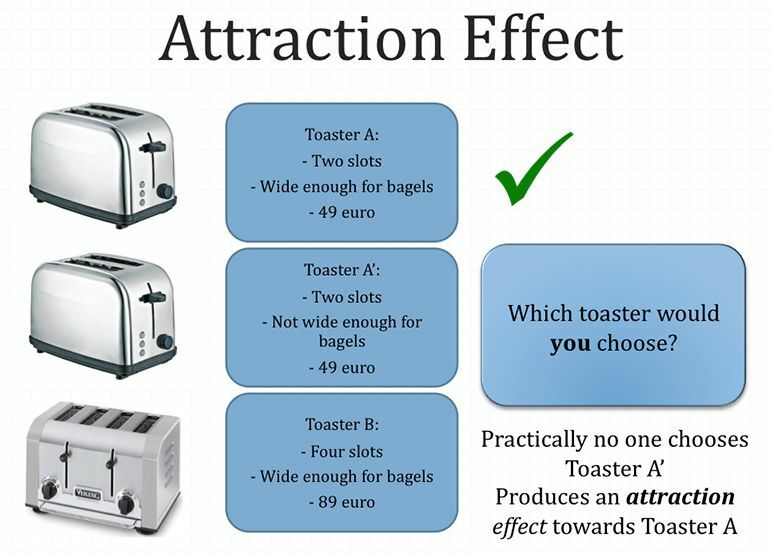 This economic assumption contradicts research on the attraction affect, where we don’t don’t make the best choice because we are influenced to do otherwise. The addition of an inferior option will draw us to choose one option from the previous choices available that appears better. Through a comparative assessment with the less attractive option, we are less conflicted about what choice to make. The appearance of a other options at the time we make a decision will affect the decision we ultimately make. Given a lower cost cheaper model with less functionality or less quality, and a more expensive similar product that has higher quality or more functionality, we only have two choices to make that are polarized between price and quality. But if a third option is introduced which is even less attractive because it has a higher price despite being of similar quality to the second option, then the attraction affect will kick in where we are likely to choose the middle expensive quality product over the cheaper product. Many studies have shown this over and over, that someone will pick the option from the original selection that clearly is better than the third option. Whereas prior to the introduction of the third option, the different characteristics or attributes of comparison were too divergent to make a simple choice. Quality is one metric, and price is another. But when a third option matches the criteria of quality, then the only thing that needs to be looked at as price. Since the third option has a higher price but a similar quality as a previous option, then obviously people are going to be influenced by the reduction in costs to purchase the same quality product. The new study is looking at the attraction affect in connection with how the time and context of available choices will affect the decision we make. This relates to choices made in haste or that provide us with a small advantage in short-term, vs. making a choice that involves waiting longer in order to receive a greater advantage. One simple example is of people who want to change their physical health or appearance through a diet. The pleasure trap and focus on an immediate gratification, satisfaction and enjoyment of something that is not good for us, or even others, can apply to food or other choices we make in life. The long-term advantage of losing weight and getting into better health is ignored because of short-term and shortsighted gains that we make from following our senses blindly. We are being driven by the illusion and appearances of our senses deceiving us into what is “good” for us instead of recognizing what is actually good for us by using our higher order consciousness capacity to override our simplistic subconscious and unconscious motivation to indulge in the pleasure trap. In this recent study, one group of students solved decision-making tasks on a computer. A conflict they faced was to choose between receiving smaller amounts of money in the short term, or larger amounts of money at a later point in time. A third irrelevant option was introduced in order to demonstrate the attraction affect. A second group was shown the same combinations of reward and time while also having an fMRI scan going on at the same time. The difference was that these students were not allowed to make decisions themselves because a random selection was made for them. They then reported their level of satisfaction with the outcome of that random selection. Depending on the options they were shown and the choice that was made for them, different levels of satisfaction were reported. Those who reported satisfaction indicate they were subject to a strong attraction affect as shown in the MRI scans with an above average affect in the brain’s reward system. We feel rewarded and satisfied when we get the thing we are attracted to, even if it isn’t in our best interest to buy it, as the classical economics would normally suggest. This study interconnects neuroscience, psychology and economics to provide more insight into how they operate together in our choices in life. 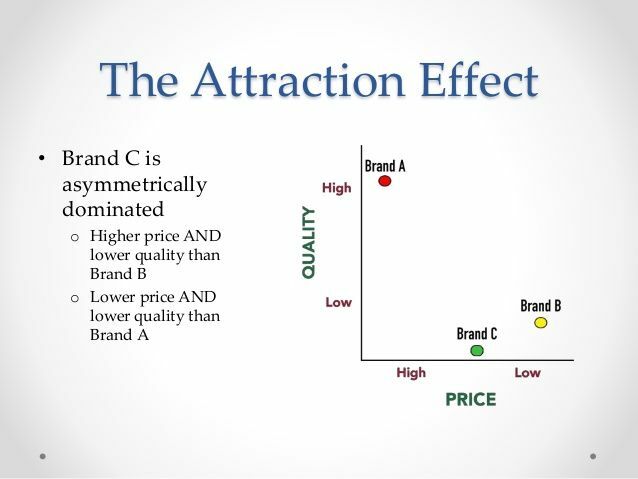 The attraction effect is heavily used in marketing. This study sheds further light on how marketing campaigns can affect people’s ability to make certain choices. We can easily be manipulated into making a choice others want us to make through the introduction of a less attractive alternative compared to a previous dichotomous choice selection. A false dichotomy can be erected with people accepting the restrictions imposed upon their choices that channel them into making a certain decision: one or the other. This is more easily accomplished when the restricted dichotomy appears less restricted through more available choices (such as introducing a third option), but in the end we are still being attracted towards one of the two original options anyways. An option is introduced that will knowingly not be chosen by anyone in order to get people to be attracted to the dominant option that was initially presented. The preference to choose the dominant option increases with the addition of a third, more flawed, option. The better option is called the dominant, and the alternative option that makes people attracted to the original option is called the dominated option because the dominant dominates it. The dominated alternative is closest to one of the previous choices, which makes that most closely-related original option the dominant option. The dominant option is also dominating over the other original option because of the attraction effect created by the comparison between the other two options. As a result, the dominant option will “steal” influence over the less dominant option. The inferior option acts as a decoy to increase the attractiveness of another option. The attraction effect is also called asymmetric dominance. Our choices are heavily influence by the frame of mind and context we are surrounded by that influences our decisions. Changing how something is presented through marketing manipulations will influence and change the frame of mind someone has towards a product or service.